When it comes to the possibilities of 'learning from history' there are doubtless many things we could aspire to learn. Some of those would be more practically useful, in terms of contributing to the normal and decent functioning of well-meaning societies than others. 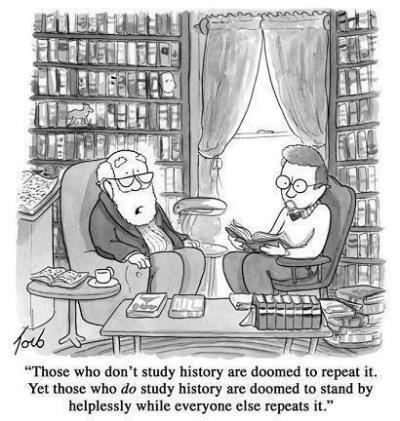 The following selection of famous quotations and quotes about ' learning from history ' begins with a few quotes in which several persons express some disillusionment about Humanity's all-too-frequent failure at actually learning from history or the past mistakes of history. The selection soon continues with other quotations where such seriously famous observers as Edmund Burke, David Hume, Immanuel Kant, Ralph Waldo Emerson and Machiavelli present views that very directly suggest that learning deep lessons from history is both possible and desirable. Our overview of this learning from history may not so much explicitly focus importance on the broader range of past mistakes of history, of which there are many, as learning useful lessons about - The Human Condition AND Social Change. This can show, through cautionary examples, how past mistakes and serious misjudgements have arisen from time to time disrupting the normal and decent functioning of would-be well-meaning societies. "Rulers, Statesmen, Nations, are wont to be emphatically commended to the teaching which experience offers in history. But what experience and history teach is this - that people and governments never have learned anything from history, or acted on principles deduced from it. Each period is involved in such peculiar circumstances, exhibits a condition of things so strictly idiosyncratic, that its conduct must be regulated by considerations connected with itself, and itself alone." "We can learn from history, but we can also deceive ourselves when we selectively take evidence from the past to justify what we have already made up our minds to do." "Human nature will not change. In any future great national trial, compared with the men of this, we shall have as weak and as strong, as silly and as wise, as bad and as good. Let us therefore study the incidents in this as philosophy to learn wisdom from and none of them as wrongs to be avenged." Socrates and Plato, two of the greatest philosophers in human history, lived circa 400 B.C. in "Ancient Greece". In a work penned by Plato, detailing conversations entered into by Socrates, views are expressed which seem to be fully compatible with the above passage from Victor Cousin. "…can we possibly refuse to admit that there exist in each of us the same generic parts and characteristics as are found in the state? For I presume the state has not received them from any other source. It would be ridiculous to imagine that the presence of the spirited element in cities is not to be traced to individuals, wherever this character is imputed to the people, as it is to the natives of Thrace, and Scythia, and generally speaking, of the northern countries; or the love of knowledge, which would be chiefly attributed to our own country; or the love of riches, which people would especially connect with the Phoenicians and the Egyptians." Even before he had first read Cousin's Introduction to the History of Philosophy, (in 1829), Ralph Waldo Emerson had expressed views in his private Journals which suggest that he accepted that Human Nature tends, and Human Beings tend, to display three identifiable aspects and orientations. Imagine hope to be removed from the human breast & see how Society will sink, how the strong bands of order & improvement will be relaxed & what a deathlike stillness would take the place of the restless energies that now move the world. The scholar will extinguish his midnight lamp, the merchant will furl his white sails & bid them seek the deep no more. The anxious patriot who stood out for his country to the last & devised in the last beleagured citadel, profound schemes for its deliverance and aggrandizement, will sheathe his sword and blot his fame. Remove hope, & the world becomes a blank and rottenness. In all districts of all lands, in all the classes of communities thousands of minds are intently occupied, the merchant in his compting house, the mechanist over his plans, the statesman at his map, his treaty, & his tariff, the scholar in the skilful history & eloquence of antiquity, each stung to the quick with the desire of exalting himself to a hasty & yet unfound height above the level of his peers. Each is absorbed in the prospect of good accruing to himself but each is no less contributing to the utmost of his ability to fix & adorn human civilization. are available on this site that give convincing support to such a "Tripartite" view of Human Nature!!! On another of our pages ~ Understanding the Past and the Present ~ suggestions are made that such "Tripartism" would support persons living out their lives long, long ago in tribes and in city-states. Capacities of Honesty, Manhood and Good-fellowship would all be highly beneficial to persons living in such small-scale Human groupings as tribes and in city-states. Individuals would tend to behave considerately towards their group-fellows, be capable of co-operation in defence of their group and be capable of entering into personal relationships and economic activity. City-states can be held to have been more viable than hunter-gatherer tribes because there could have been greater food security through stored agricultural surpluses and more opportunity to enter into trade within and between city-states. More recently Europe featured Monarchies and Empires - where some men worked, some men fought (Knights) and some men prayed (Priests). Such dynastic sovereignty being displaced in time by Constitutional Monarchies and Republics where democracy applies. ~ Should this be true it would follow that Human Societies often tend to arise out of the Human Condition as directly influenced by Human Nature! This view suggests that "Non-Doctrinaire" Societies themselves!!! often have a Tripartite character. "History cannot give us a program for the future, but it can give us a fuller understanding of ourselves, and of our common humanity, so that we can better face the future." "Together we must learn how to compose difference, not with arms, but with intellect and decent purpose." We have prepared some fairly detailed, but hopefully "truth-full and informative", pages about a most deeply revealing episode in European History in the spirit of attempting to learn worthwhile lessons of history!!! The events of 1848 display the existence and latent power of many societal pressures which have subsequently fully contributed to the "Emergence of Modernity" in the Western world. Prior to 1848 the existence of these societal pressures was often unsuspected or ignored, - their latent power was certainly vastly unappreciated. In February 1948, the British historian Lewis Namier delivered a lecture commemorating the centennial of the European Revolutions of 1848. "1848 remains a seed-plot of history. It crystallized ideas and projected the pattern of things to come; it determined the course of the following century." If Namier is right in viewing the "Revolutions of 1848" as featuring a seed-plot of history, and if we can identify the early attempts at growth and development by such evident resulting "seedlings" as Liberalism, Constitutionalism, Democracy, Socialism and Nationalism ~ including such competition as came to exist between them for "a Place in the Sun" (in situations where, although shaken, down-but-not-out dynastic authority was usually trying to suppress them, fairly successfully in 1848 and with diminishing effectiveness over ensuing decades) then surely we will have succeeded to some degree in actually learning lessons of history. Learning lessons of history can surely be seen as a pressing necessity in the hope of yielding up some guidlines for the adoption of practical policies intended to enhance the possibility for the lessening of injustices and for the avoidance of conflict. We would hope that our coverage of this "dramatic historical watershed" will provide something of a persuasive outline as to how it came about that the Dynastic Europe of 1815 came to undergo those sweeping changes which have tended to produce the populist Europe of Modern Times! 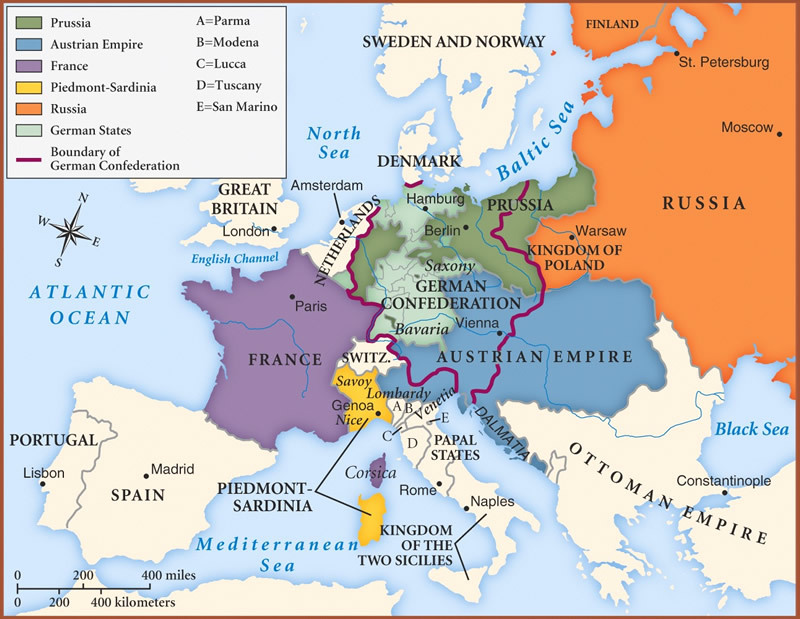 The European political map above, agreed at the Congress of Vienna of 1815, saw some changes, (principally due to the emergence of Belgium and Greece), before the widespread Revolutions of 1848-1849.
seceding, early in 2014, to become closely linked with the Russian Federation). [N.B. Our Series of European History pages focus mostly on Europe in the nineteenth century and continue with coverage of Italian Unification, (as orchestrated by Cavour), and German Unification, (as orchestrated by Bismarck), and the Diplomacy underlying the settlements to the First World War ~ another tempestuous historical watershed ~ (as influenced by Woodrow Wilson].